How Far Would You Go To Live Your Purpose? I still remember the moment I knew that I could live in Alabama. My husband Jonathan and I were visiting the Southern town where we live now, walking hand in hand past the elegant public library. Not much was happening on the outside, but from within a simple knowing arose: I could walk to this library. This could be our hometown. We could live here and be happy. Would You Dare To Go ‘All In’ On A Dream? There’s something magical about deciding to go all in. In that moment when you make the heart-pounding decision to commit to doing whatever it is you most need to do, energy starts flowing through you. 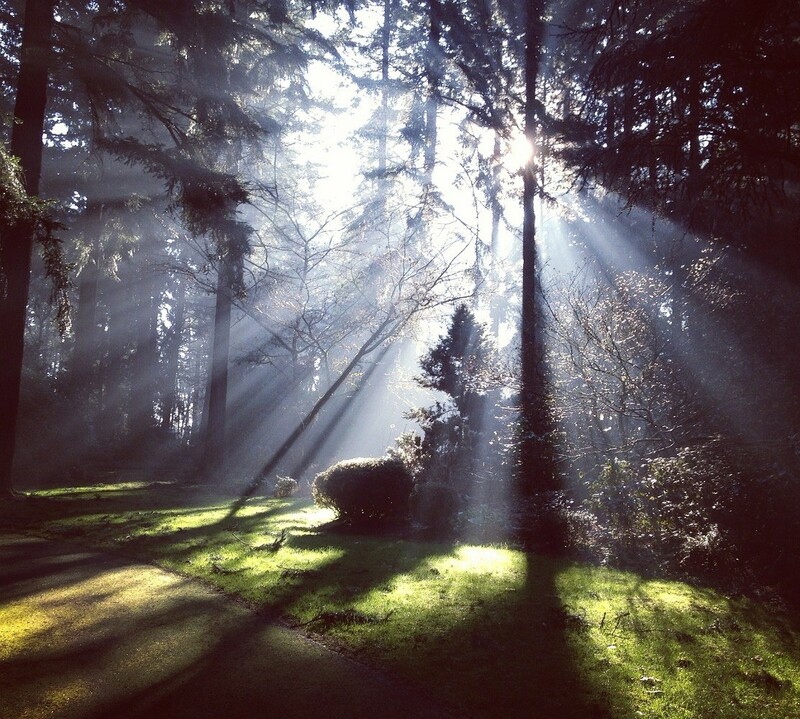 Things happen to make you feel as though you’re not alone, as though Something or Someone is blessing your efforts. It’s as though a mysterious force actually wants you to succeed. This is both unnerving and exciting. Just a year ago, I dreamed (and feared the dream) of becoming a full-time writer. I longed to work on projects that inspired me, and to spend more time nurturing the relationships that matter most. And with a lot of hard work and even more grace, that dream has become reality. But the story doesn’t end there, because once you go through the process of seeing one dream to fruition, you get to think bigger … even as you continue to live out the truth that big things start small, always. Recently, I decided to go all in on my next dream — bringing a new book into being. The details are under wraps (new ideas need time to grow deep roots), but I’m working on a new collection of stories. And the process of putting together a book, humble and hard as it is, always changes me. Yet even though I love to make books, the process scares me, too. I’m only human. I hesitate and make excuses — the usual ones about money, time, and responsibility. But deep down, I know: they’re smoke screens. Having come face-to-face with this, I told my husband Jonathan about it on our evening walk. As we strode through our neighborhood, I said that I wanted to dive into the new book, but that doing so might mean less earned income for a time. I knew that we’d be fine, but still, the choice to write the book would affect us both. He listened and nodded calmly, with a look of concealed excitement in his eyes. And I remembered: for as long as we’ve known each other, we’ve been daring one another to move toward what matters most. We turned a corner, and Jonathan said, “Let’s walk by the fountain on our way home.” I thought he meant a central fountain I pass every day, but he led me to the University of North Alabama’s campus. 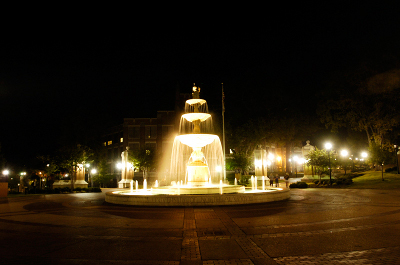 I was unprepared for what I saw there: a fountain all aglow, streaming beautifully into the night. We stood by the fountain’s dedication plaque. And as I read, I felt a ‘God-jolt’, a surge of energy that directs me in my biggest decisions. If I had to put it into words, it would translate to something like: This is not random. This is right. It happened when I went for a walk at a retreat center in 2009. I stopped still on a forest path with this truth washing over me like waves: If Jonathan asks me to marry him, I will say yes with all my heart. Dreams worth achieving take time and effort to come to fruition. Even so, there are a few small things you can do that would help me a great deal today. Share A Wish Come Clear with friends & family, & invite them to receive Your Creed of Care: How To Dig For Treasure in People (Without Getting Buried Alive). Vote for A Wish Come Clear as a blog contributing to positive social change at Bloggers for Good. I’m scheduled as a guest on Heather McCrae’s Neurodiversity Radio program tonight, Monday, July 23rd, at 8p EST (7p CST). You’re more than welcome to tune in for the (free) show. My friend Jill Egle, a self-advocate and leader in the ID community, has an amazing life story. She’s also featured in a recently-published book, Jill’s Journey: A Victory Over the “R” Word. Liked this post? 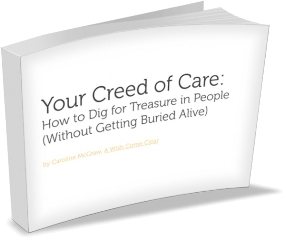 Receive new posts via email, along with your complimentary copy of Your Creed of Care: How To Dig For Treasure In People (Without Getting Buried Alive).